After my trek on Kilimanjaro I had to attend the MobiSys conference in Singapore, so I sent my trekking gear westward with Ken while I headed east. 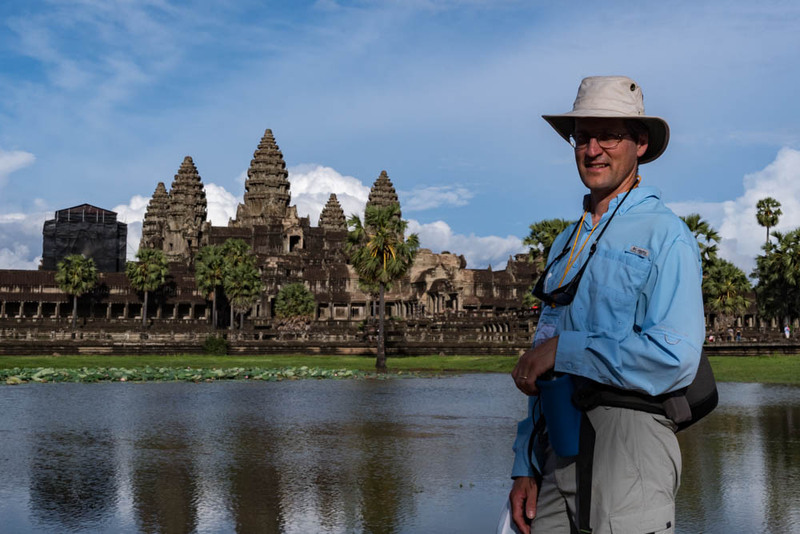 While planning the trip I realized that Cambodia and the famous ruins of Angkor Wat were a short hop away, so I extended the trip with a quick visit there. What a contrast with Kilimanjaro and Tanzania – but what a great opportunity! 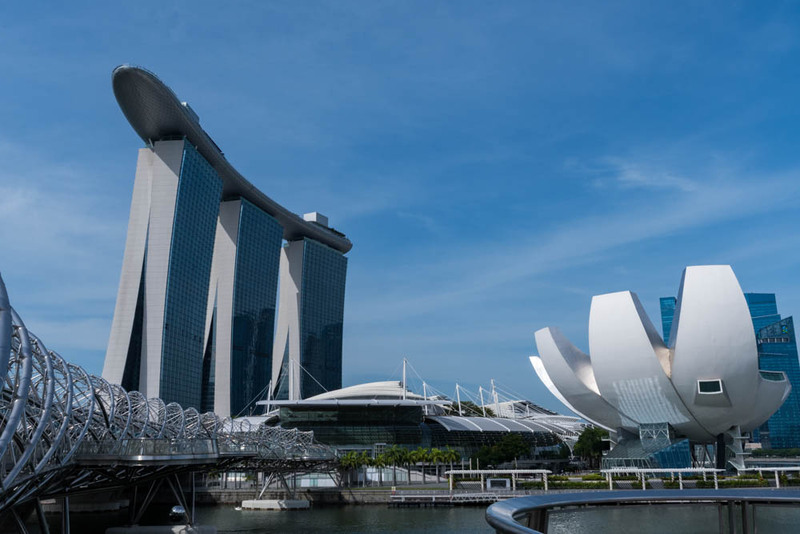 Marina Bay Sands hotel, with Helix bridge in foreground. 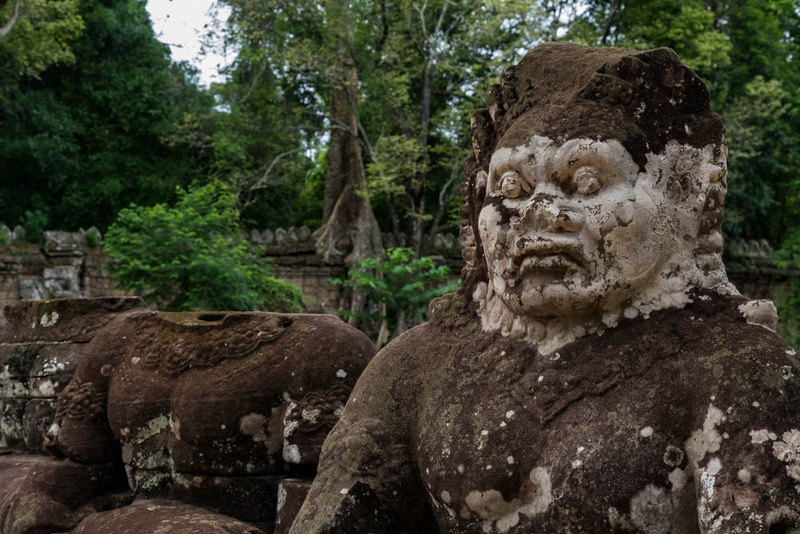 Angkor Wat may be the largest and most famous of the many temples in the Siem Reap area of Cambodia – but the others were equally if not more interesting. Originally a Hindu temple early in the 12th century, and later transformed into a Buddhist temple. It is purportedly the largest religious monument in the world. An incredible temple complex from the late 12th century. Nearly 3km on a side, this is the largest complex we visited. Indeed, I think Angkor Thom was far more interesting than Angkor Wat, though it is not as grand or famous as its cousin. 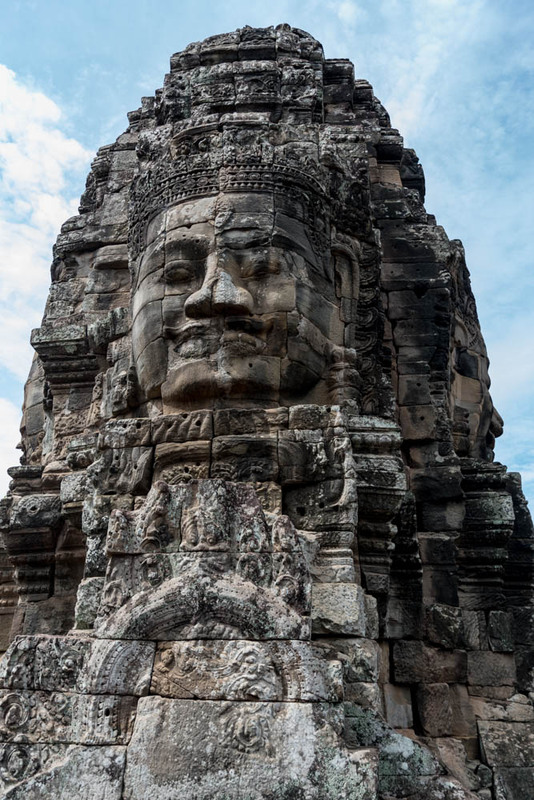 The “royal sword” temple was built by the same king who built Angkor Thom, in this case to honor his father. It was built in the 12th century. 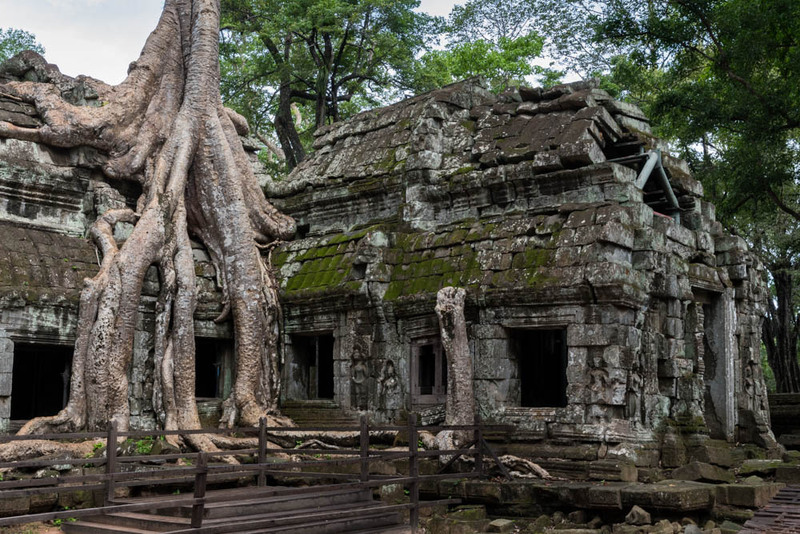 One of the more impressive temples in the Siem Reap area, if only because of the huge “Spung” trees that have woven their roots and trunks in among the blocks of the temple. These trees support the temple, and destroy it too! Originally built in the late 12th and early 13th century. 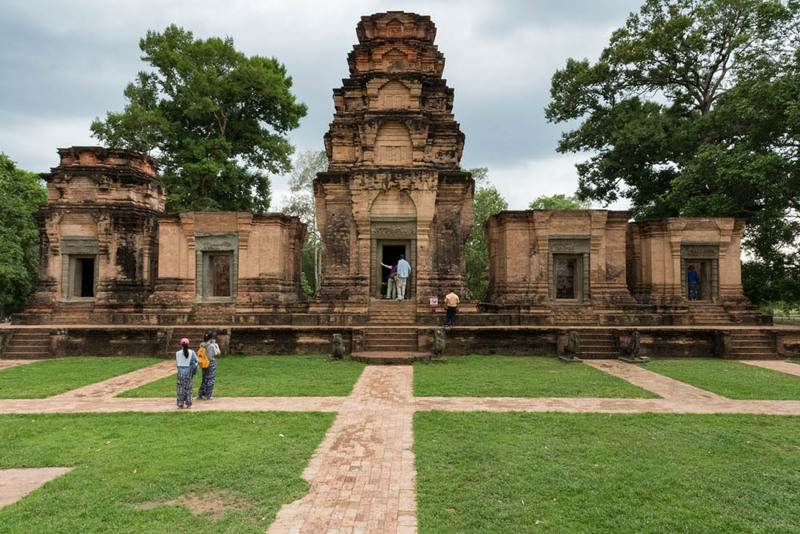 A small 10th-century Hindu temple, predating the better-known temples of the Siem Reap area, Prasat Kravan is worth a visit. The main door includes extensive Sanskrit carvings. 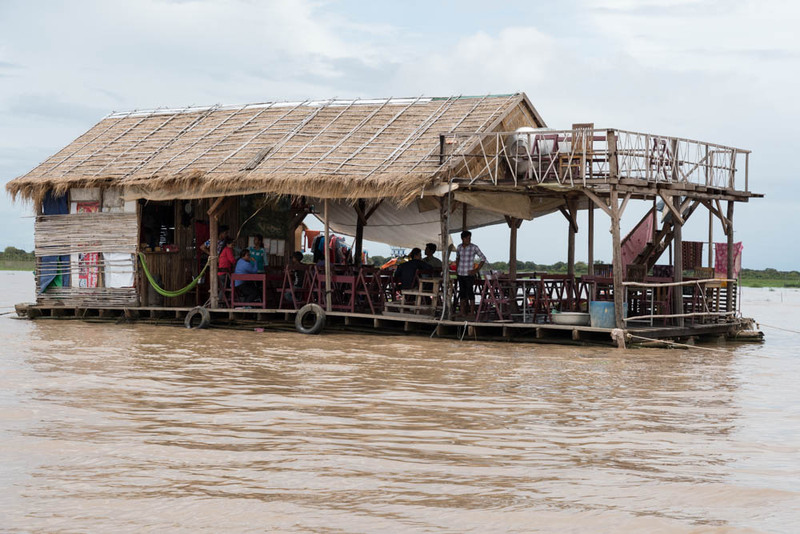 A bar in the Floating Village near Siem Reap, Cambodia. In addition, we visited one of the floating villages on Tonle Sap, a huge lake that dominates central Cambodia. The residents of this village construct homes on boats and barges, which they tow out onto the lake during the dry season and anchor in the shelter of the shore’s wetlands during the rainy season. This small village seemed to have a complete set of services, including two schools, a church, a restaurant, a bar, and a convenience store. We also drove into the center of Siem Reap, one evening, to visit the Night Market and the famous Pub Street. The nightlife is certainly hopping, where backpacking twenty-something tourists hang out after dark and enjoy $1 cocktails sold by street vendors and wander among the competing rock music blasted from the cafes and bars along the streets. The heat has diminished somewhat, but the humidity is still at maximum. (Indeed, Cambodia makes Singapore seem cool and dry. ;-). A great place, certainly deserving a more extensive visit someday.